Organizer of weekly marches along Gaza border says Friday demonstrations will send message of unity against political "plots". Daoud Shihab, a member of the “National Council of the Great March of Return”, announced on Thursday that the weekly demonstrations along the Gaza border will be held this Friday under the title "Gaza and the West Bank - one blood and a shared destiny." The slogan of the demonstrations, Shihab said, is meant to send a defiant message to Israel, a message of steadfastness and determination to continue the demonstrations, which he said were an impressive achievement. In an interview with the Hamas newspaper Al-Risala, Shihab added that the demonstrations would convey a message of Palestinian unity against the plot to harm the Palestinian cause. He called on Palestinian Arabs in Judea, Samaria, Jerusalem, and everywhere else they may be to go out in masses to the “settlements” and the checkpoints in order to fight "the colonialist settlement." The so-called “March of the Return” protests have been taking place every Friday since March 30 and have been openly encouraged by Gaza’s Hamas terrorist rulers. 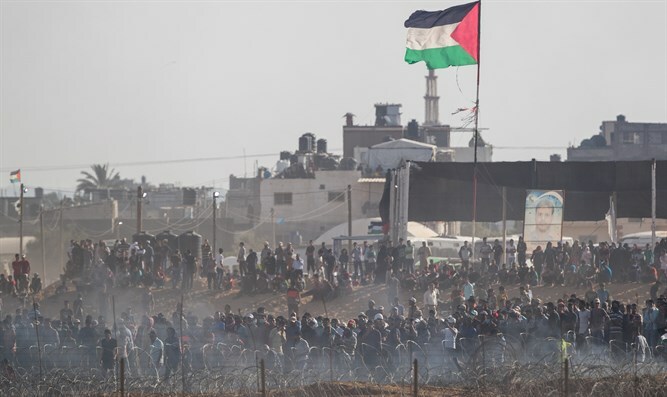 In these weekly violent riots, Gazans have hurled rocks, firebombs, and flaming tires at Israeli soldiers securing the border and have used makeshift “terror kites” and “terror balloons” to drop explosives on Israeli positions.